The creator of the social awareness brand GLOSSRAGS shares some ways to remain well despite the devastation of police killings in the black community. On Tuesday in Baton Rouge, Louisiana, 37 year-old, father of five, Alton Sterling was shot and killed by police officers in front of a convenience store. After harrowing video footage of the shooting was released to the public, the atmosphere on social media became instantly despairing. Black Lives Matter activist and creator of the socially charged brand GLOSSRAGS, Randi Gloss has been on the front lines as an advocate for justice against police violence against the black community since 2012 and she's coped with quite a lot of loss. 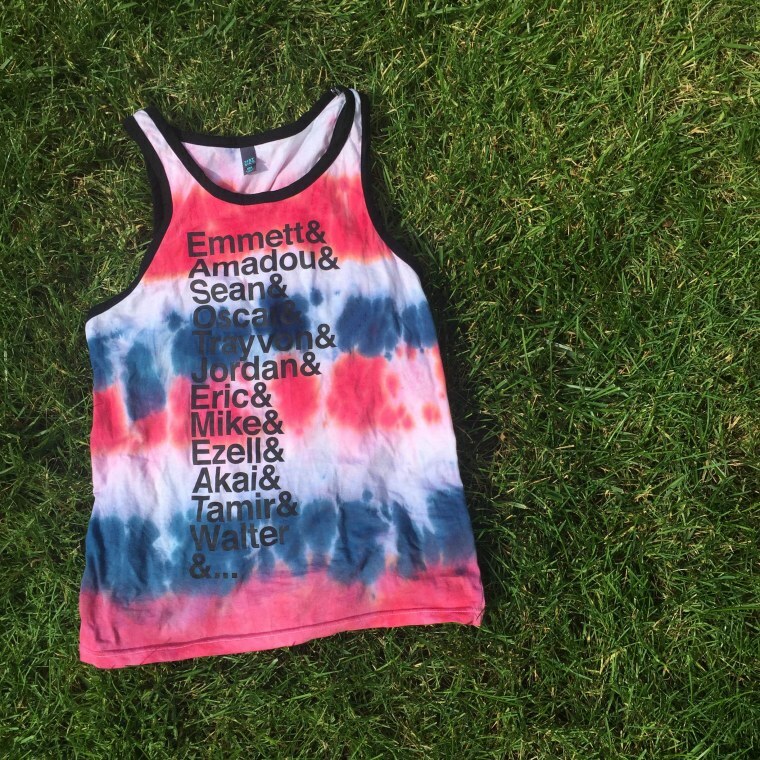 Her brand's most coveted item is a shirt that lists the names of victims of U.S. police violence. 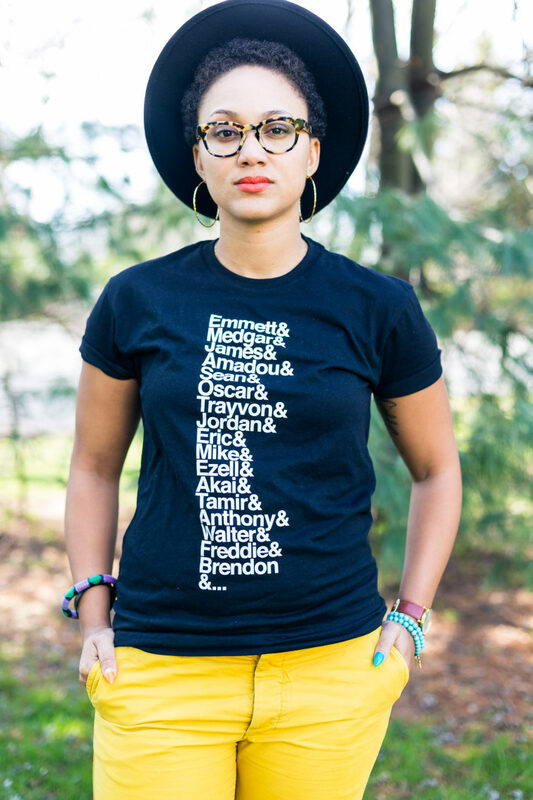 Over the past year, the 25 year-old change maker has continued to add more names to the shirt as more black people have been killed by police officers across the nation. Gloss spoke to The FADER on Wednesday morning over the phone from Washington D.C. She explained how to honor wellness in mourning and ways that black people can indulge in self-care through times of black trauma and death. RANDI GLOSS: I think in some ways it feels like we’re on a sinking ship and that many of us feel like we’re drowning in this sorrow or in so many ways being water boarded. Like our black skin is holding us hostage and America is constantly washing us, suffocating us and throwing buckets of trauma down our throats over and over again to the point where we’re gasping for air. We’re trying to come to the surface. It feels like we’re drowning in our own blood because every time we turn around it’s somebody new. I was just saying how this summer has been relatively quiet and this year has been quiet compared to last year. I think by May of last year, I had added another four or five names [to the shirts] because there were so many people. This year has been a lot different but it was only a matter of time. I was talking to Netta this morning and I was saying how engaging with Alton Sterling’s death is like looking into water, taking a deep breath, diving deep and taking the plunge again. I can’t sit this one out because there have been names that I haven’t been engaging. I haven’t been engrossing myself in that trauma because I’m still trying to recover from so many others. That’s not apathy but in some ways that can be a means of self-care. It’s not clicking on every single name that’s been hashtagged because that really can drag you down. This death really brought me back into the fold again because it’s just so blatant. What social media does so well, especially Twitter and Instagram, is it gives us the platform to just express ourselves, our feelings, our sadness. I would encourage people to keep speaking out about that. Get together and have conversations in person. Having the physical presence of someone next to you kind of serves to fill that void. It’s weird thinking about how you fill the void for the loss of somebody that you’ve never even met. That’s a really challenging question and phenomena or an epidemic even because it keeps happening. Today is July 6th—we’re just about a week away from [the one year anniversary of] Sandra Bland’s murder. Then we have [the two year anniversary of] Eric Garner and Mike Brown. So, what’s left of the summer will also be a lot of mourning. It’s something to be cognizant of because for me, it will dictate my mood, it will drain some of my energy. Gathering together in spaces where we can have conversations or even spaces where we can laugh because we still have to celebrate the black boys and the black girls and the black fathers and mothers who are still alive. We have to celebrate that there is black life on this earth. Maybe it’s not something that is completely free to be, but there still is black life worth celebrating and that’s something we have to remind ourselves of. If we’re always focusing on the loss or we lose ourselves in the loss, in the mourning and the trauma, we’ll forget that we have lives that are still very much worth living and that there is some joy in being black and alive in 2016.